As a regular listener to Tim Ferriss’s podcasts, I’ve heard him talk about journaling. I’ve been interested in journals since I read Walden by Henry David Thoreau. He used his journals to consider nature and life through the writing process. Ferriss recommended the Five Minute Journal, so I ordered a copy. When I finished it (in about seven months), I had to decide whether to order another copy. My preference lately has been to minimize ink-on-paper when Dropbox is more accessible from my iPhone and iPad. So, I decided to create my own journal format in Evernote. This post contains my current journal format. It’s current because I tweak the format and approach to topics almost every time I update my journal. Because how I write about a topic changes with what I think is important I overwrite the previous entry on a topic from day-to-day. The entries tend to develop over several days’ of revisions until I don’t have anything more to write, then I may change the topics. Here are the current headings in my journal with notes in italics. At the end of the day or the first thing the next day, I write three short bullets about what I did that day consistent with what I’ trying to do with my life. This tends to be variations on a theme that develops over time, rather than specific undone tasks. For example, a recent theme has been; Produce more. Consume less. Simple, how many words did I write yesterday. My goal is low; and I’m disappointed how often I fail. I’ve mentioned the number of days on Twitter (@charlieahern) and Facebook (Charlie Ahern). People reply with “one day at a time” encouragements. I’m not a member of AA and don’t consider myself a serious alcoholic (quitting has seemed too easy). One day I woke up with a hangover and regrets from the night before, and then decided to stop drinking alcohol. Is there something that you’d like to do or not do over a long period of time. Counting the days may help you be more aware your string of successes. If you lapse, don’t give up simply re-start the count. I’m trying to pay more attention to the changing seasons. For example, this spring at sunrise we’ve had a murmur of starlings looping around our apartment. Of course, I did have to find out what “waxing gibbous” meant. The “You” is usually someone I may seldom or never meet, but who deserves some thanks. This is a new daily practice that’s not as easy as you may think. It takes some time to identify someone and write a note that has some meaning. Some simple statement about what is or would be a good thing. No, this is not an “affirmation” about how I’m becoming more perfect every day. I refer to Maslow’s Hierarchy of Needs to prompt ideas. Some days I’m just grateful that I have relatively clean water to drink. This tends to be a big picture, though specific, goal. What do I aspire to do? Note that this is not a mission statement that goes on the shelf and remains forgotten. I read and revise it whenever I journal. What big stuff do I want to do this year that will take some action? I have three goals. For each of the BIG Goals, what will I do today to move the ball forward? Each action should be worth doing on its own, because if I don’t hit the goal at least playing the game will be fun. This entry was posted in Inspiration and Spirit, Work and Money and tagged discipline, focus, inspiration, journal on March 30, 2016 by Charlie Ahern. During his podcast interviews, Tim Ferriss often asks people about their morning routines. He also mentioned The Five-Minute Journal. I bought a copy of the journal and started being more intentional first thing in the morning. I’d be interested if you have an interesting morning routine or have suggestions for me. 5:30 am, approximately – Wake up. No alarm clock. Usually I’m asleep by 10 pm, so I get about seven to eight hours of sleep. 5:30 to 5:50 – Listen to a guided (vipassana) mediation by Tara Brach. I do this while still in bed. For me this is like yoga; a physical, rather than spiritual practice. A relaxing way to fully wake up. The Intellectual Devotional. One page write-ups about history, literature, visual arts, science , music, philosophy, and religion. The last three topics were the Hagia Sophia, black holes, and instruments & ensembles. The title is so pretentious I don’t like to admit that I’m reading it. The Daily Book of Art. One page write-ups about visual arts. The last three topics have been Texture, What is the Purpose of Art?, and Early Christian & Byzantine Art. The Oxford Dictionary of Philosophy. Cross-referenced definitions. Usually I follow a string of definitions; materialism > atomism > field theory. This can be a heavy lift in the morning: Logic > predicate calculus > propositional variables. I may replace this one. This morning I picked up Enterprise Integration Patterns, which I bought a few years ago, but haven’t finished. However, deciphering Java Message Service code might also be too heavy a lift for early morning. 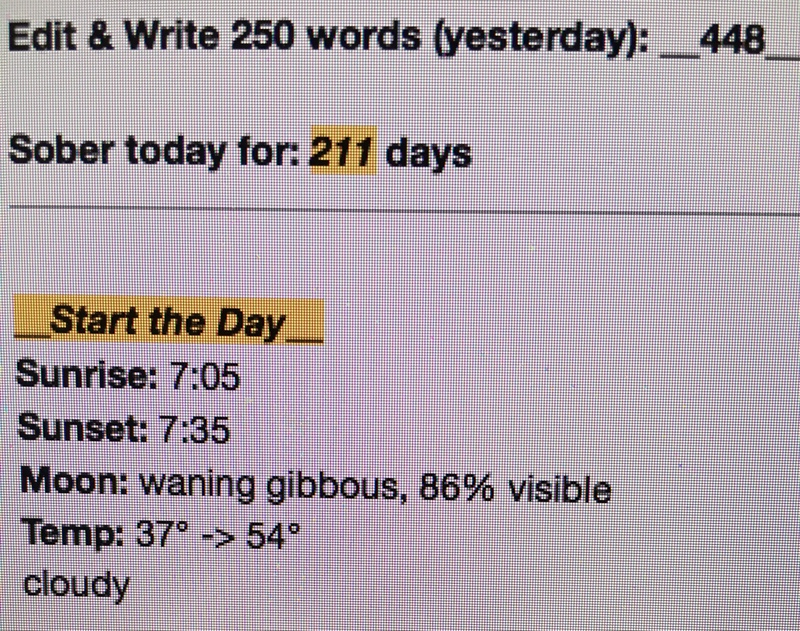 6:15 to 6:30 – Write in The Five-Minute Journal. I try to write for no more than five minutes, but usually go longer. The Journal has enough pages for about seven months. I’m about halfway through. When I finish all the pages in this book, I think I’ll buy a blank book and design my own daily outline. Now that the weather is getting warmer, I plan to bicycle to work. Leaving at 6:30-ish. This entry was posted in Health and Fitness, Inspiration and Spirit and tagged journal, meditation, morning, reading, routine on May 20, 2015 by Charlie Ahern.